Once Chuck Greenberg spotted those soulful, brown eyes on that cool April day in 2005, it was all over. And when his wife, Jenny, met Tyler later that day, she agreed he was one very special greyhound. But neither of them realized how truly remarkable Tyler would prove to be over the course of his amazing medical journey. It is their hope that Tyler's story of resilience and triumph will inspire and educate others with greys fighting serious health issues. Tyler was born on July 1, 2002 - the "D" pup in a litter of seven born to the sire Greys Statesman and dam Neddle Fish, out of the Douglas Kennel in Wheeling, West Virginia. His short-lived AA racing career took place between February and September in 2004 at the greyhound track in Wheeling. Tyler won five of his 33 races under the moniker of "D's Makeithappen". His last win was on August 11th of that year, but after that race his results began to decline and it was determined that his future racing experience would be limited to running zoomies around a sofa or in a nice back yard somewhere in suburbia. Little did Tyler know that his journey would eventually take him from West Virginia to Pennsylvania and then to Texas. The Greenbergs had lived in the Pittsburgh area for most of their lives. In late 2004, they were happily ensconced in Upper St. Clair, a suburb just ten miles south of the bustling Steel City. Their "pups of choice" had been Westies for years. They lost Hank to bladder cancer at the tender age of seven in November 2004. Hank's five-year-old best buddy, Holly, sadly mourned his passing along with the Greenbergs - so Chuck and Jenny wasted no time in adopting another Westie puppy as a companion for Holly. Little Jack bounced into their lives in December 2004, about a month after Hank's passing. He was called "Little Jack" to distinguish him from the Greenbergs' middle son, Jack. "Human Jack" and his brothers, Jeff and Ben, were all teenagers at this time. Jeff had just left for college, to be followed a few years later by his brothers. They never worried about their parents suffering from "empty nest" syndrome, because they knew their canine siblings were a big part of the family and would certainly help ease their parents through the transitions ahead. However, they didn't realize their family was about to grow even more with a new breed and a very special dog who would take them all on a fascinating odyssey through cutting-edge veterinary medicine. 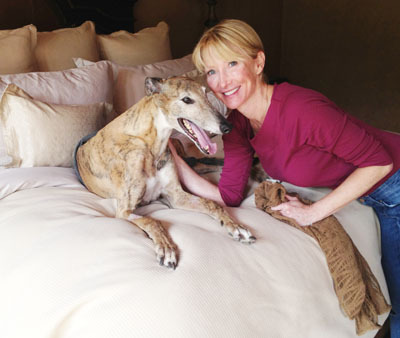 Over the years, Jenny had read numerous articles about the plight of greyhounds after the ends of their racing careers. 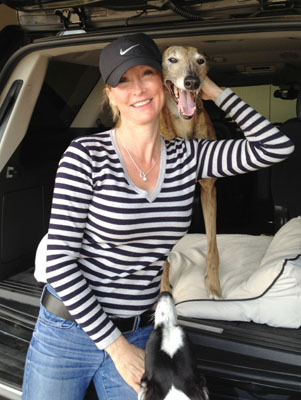 She and Chuck were thrilled to hear about the many adoption and rescue groups that had been started in recent years to bring awareness to this problem and provide a safe haven for former racers and other greyhounds in need. Shortly after Hank's death, Jenny read an article about Monica's Heart, a greyhound adoption agency in Altoona, Pennsylvania. After giving the idea careful consideration, Jenny and Chuck decided to expand their family by opening their home to a greyhound - but Tyler was not their first choice! Jenny and Chuck studied the Monica's Heart website for quite a while before they finally decided that Marv (aka "Bad Midwest Marv") might be the grey for them. The five-year-old AA racer had won fourteen of his 125 races at Wheeling, but the Greenbergs weren't interested in his stats. They just fell in love with the white grey's adorable brindle eye patch and stunning blue ticking. While perusing Marv's photos and other information on the website, they also noticed a light brindle named Tyler, who had "crazy eyes" and reminded Jenny of the aardvark from The Pink Panther. On that fateful day in April 2005, Chuck drove to Armagh, PA - about 55 miles east of Pittsburgh - to meet Marv at the home of a woman who boarded greys for Monica's Heart. After spending some time with Marv, Chuck realized that he would not be going home without the gorgeous, regal grey. But he was still drawn to Tyler, in the adjacent kennel. Chuck realized that Tyler's photo on the website did not do him justice. He was an incredibly handsome brindle boy with striking brown eyes that did not look crazy at all in person! Knowing that Jenny would instantly approve, Chuck made the "game-time" decision to adopt both Marv and Tyler on the spot. He headed back home with the boys muzzled in the back of the car. While Marv just sat calmly, taking in the passing countryside out the window, Tyler stood nervously for most of the ride, occasionally whacking Chuck with his muzzle. After meeting Tyler, Jenny was not at all surprised that Chuck was unable to leave him behind. She immediately began scurrying around to procure extra feeding dishes, beds and other supplies for the unexpected addition to the family. The Greenberg pack had doubled, and now it was time for position jockeying! Marv quickly established himself as the alpha dog and began his confident dominion over the Greenberg pack. Holly was fairly laid back and took all the changes in stride, but Little Jack decided that he was a very small greyhound at heart. He loved to run races with Tyler and Marv in the back yard. He quickly learned to cut corners so he could keep up with the "other" greyhounds and improve his chances of competing with his long-legged new brothers. Tyler had several problems settling into his new environment. He was extremely skittish and a bit snappish. Perhaps he wasn't happy that he lost out on the top dog position to Marv, or maybe he was just naturally high strung. Jeff and his brothers wondered why their parents would want to keep such a "high-maintenance" dog. Jenny and Chuck made it clear that Tyler was there to stay. They knew he needed and deserved some special love and care. Tyler's rough start makes it even more remarkable when considering the transformation in his personality that came later in his life, when he was forced to undergo so many challenging medical treatments. In the face of such adversity, Tyler exhibited a calm nature, inspiring resilience and uncommon courage that endeared him even more to Jenny and Chuck. Things rocked along for the next four years without incident, but in the fall of 2009 Tyler's medical odyssey began. His first symptoms were very loud breathing and snoring. Tyler's vets at Brush Run Veterinary Clinic - Drs. Rubis, Vohl and Sullinger - decided to first try treating him with Prednisone (a synthetic steroid) and antibiotics. When his condition did not improve, they referred Tyler to Dr. Rebecca Newman, an oncology specialist at Pittsburgh Veterinary Specialty and Emergency Center (PVSEC). After analyzing a biopsy, Dr. Newman diagnosed Tyler with rhabdomyosarcoma (RMS), a type of soft-tissue tumor that is very rare in dogs. Tyler's tumor could not be removed through surgery due to its position at the top of the larynx and esophagus. As a result, Dr. Newman determined that radiation would be the optimal treatment, but the closest radiation facility at that time was three hours away in Columbus, Ohio. Beginning in November 2009, Tyler's new "home away from home" for the next four weeks became Dr. Deborah Prescott's clinic at the Medvet Medical and Cancer Center for Pets at Ohio State University. Jenny drove Tyler to Columbus early every Monday morning and picked him up every Friday so he could enjoy the comforts of home over the weekend. During this four-week period, Tyler received a total of 19 radiation treatments while under general sedation. He was quite the trooper - taking all the transporting and medical treatments in stride. Tyler's reward every Friday night was a special home-made treat of ground beef, white rice, yogurt and hard-boiled egg. Fortunately, the Greenbergs' three sons were already in college or law school by this time, so Jenny was free to focus on being Tyler's #1 Care Giver without having an adverse impact on her household. However, she had to shoulder the vast majority of the burden of Tyler's cancer treatments, because Chuck was in Texas for long stretches of time during this period. He and Nolan Ryan were heading up an investor group that would eventually purchase the Texas Rangers out of bankruptcy, and the complex negotiations were monopolizing most of his time. Marv, Holly and Little Jack took all of the comings and goings in stride and never missed a beat. By late 2009/early 2010, it was clear that the radiation had worked quite well. The tumor was definitely smaller, and Tyler's snoring and breathing were much quieter and closer to normal. Tyler could still bark at this time, and his health was excellent - except for a stubborn bladder infection in the summer of 2010, which required a short hospital stay. His bladder condition was later stabilized with a regular regimen of Crananidin. The Rangers deal was finally completed in August 2010, at which time the Greenbergs purchased a home in Westlake, a suburb between Dallas and Fort Worth. Chuck spent virtually all of his time in Texas then, operating the Rangers and working out all of the intricacies of the new venture with Ryan and the other investors. Jenny took care of Tyler and the other pups while coordinating the move to Texas. In the midst of making final plans for the relocation in January 2011, Jenny took Tyler for one last follow-up exam with Dr. Newman. To everyone's surprise, Dr. Newman discovered that Tyler's tumor had begun to grow back. Chuck and Jenny were very concerned about finding the right veterinarians in Texas, who could treat Tyler with the same level of expertise and care as Dr. Prescott and Dr. Newman. Chuck spoke to Eric Nadel, the long-time play-by-play announcer with the Rangers radio broadcast team. Eric had recently lost one of his dogs. He and his family were consulting with a dog trainer and behavior specialist who was counseling them through their grief. Eric introduced the Greenbergs to the dog trainer, who referred them to Dr. Garry O'Neal at Golden Triangle Animal Hospital in nearby Southlake. Dr. O'Neal immediately began consulting on a treatment plan for Tyler, and before Jenny and the dogs even arrived in Texas, he referred the Greenbergs to Dr. Phillip Treuil, an oncologist at Veterinary Specialists of North Texas (VSNT) on Greenville Avenue in Northeast Dallas. Jenny, Tyler and the rest of the pack joined Chuck in Texas in late January 2011 - the day before the record "Super Bowl Ice Storm" hit Dallas -- perhaps a harbinger of the adversity that was still ahead for Tyler and the Greenbergs in the next two years. A week after arriving in Texas, Tyler began his new regimen of radiation treatments, as recommended by Dr. Treuil. For four weeks, Jenny and Tyler arose before the crack of dawn to make the hour-long drive to VSNT. Tyler was placed under general anesthesia at 7:00 every morning for each of his 22 radiation treatments. While Tyler spent the day at VSNT, Jenny drove back to Westlake to work on getting settled in the new home. Then she made the drive back to Northeast Dallas each afternoon to pick up her special boy. On the way back home, they always stopped at a nearby Starbucks so Jenny's "cheerful good soldier" could enjoy his new special treat - a "very berry" coffee cake. 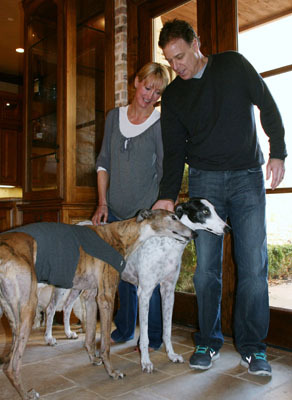 During Tyler's radiation treatments in late February 2011, Dr. Treuil left VSNT and Tyler's treatment shifted to Dr. Glen King, a radiation oncologist who was in the midst of relocating from Gulf Coast Veterinary Specialists (GCVS) in Houston. In June of that year, Dr. King examined Tyler and gave him a clean bill of health. The tumor had been dramatically reduced in size and showed no sign of regenerating. But Tyler's good news was followed very shortly by some bad news on Marv. On July 1st, Marv was diagnosed with osteosarcoma (bone cancer) in his left rear leg. Chuck and Jenny had to make the very difficult decision to fight Marv's cancer and relieve his pain by amputating the 11-year-old grey's diseased leg. The surgery on July 14th seemed to go well, but Marv died suddenly early the next morning. After Tyler's extended and successful fight against cancer, Jenny and Chuck were devastated and grief-stricken that Marv had died so suddenly and unexpectedly. Just two weeks after Marv's death, Tyler developed heat stroke, a condition to which he was more susceptible, due to his other health issues. Chuck rushed him to Golden Triangle, where Dr. Steve Ruffner administered treatment. At the time, Tyler's chances of survival were 50/50. Dr. Ruffner sent Chuck and Tyler to the Animal Emergency Hospital of North Texas (AEHNT) in nearby Grapevine, where on Dr. Ruffner's orders, three units of plasma were waiting for Tyler. Remarkably, Tyler recovered completely and suffered no complications from his latest medical episode. The next few months were thankfully quiet and uneventful. Tyler was his happy-go-lucky self - holding court on his favorite dog bed or his "man cave sofa" outside - whether in Westlake or in the other family home in Pennsylvania. The family traveled to Upper St. Clair that fall, to relax a little after all of the stress of the prior months and spend some time with their sons and other family members over the holidays. While in Pennsylvania, they decided to adopt another greyhound - Coyote (aka "Kiowa Cry Coyote") - a three-year-old white grey with black eye patches and ticking. Coyote, a grandson of the famous Gable Dodge, was a D racer with five wins out of 47 races in Florida. 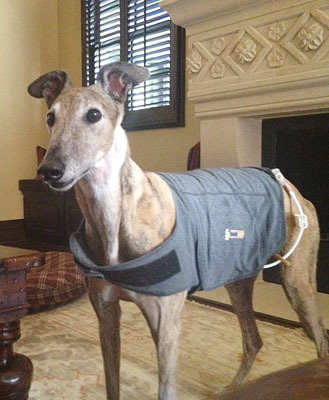 The Greenbergs adopted him in November 2011, from Fast Friends Greyhound Rescue in Boonsboro, Maryland. In late December of 2011, Chuck and Jenny headed back to Texas with Tyler, Coyote, Holly and Little Jack. The family's respite was short-lived. By mid-January in 2012, Tyler once again began to experience breathing problems. His barking became very "raspy" and barely audible at this time. A consultation with Dr. King confirmed the Greenbergs' worst fears; the tumor was coming back. Dr. King referred Jenny and Chuck to Dr. Jim Vulgamott, Chief Internist (and a founder) of GCVS in Houston. Jenny took Tyler to Houston in early March 2012, at which time Dr. Vulgamott determined that Tyler's only hope was to ablate the tumor. Ablation is a treatment method that destroys a tumor without removing it through surgery. This procedure was performed during that first visit to Houston in March. While the treatment was successful in destroying the tumor, it left Tyler with an inability to swallow food, due to scar tissue from the cumulative effect of prior treatments. Within just a few weeks, Tyler lost approximately 18 pounds - dropping to a dangerously low 59 pounds, a very unhealthy weight for a greyhound of his size. Concerned about the weight loss, Dr. King and Dr. Vulgamott recommended that Tyler return to Houston for additional evaluation by Dr. Derek Burney at GCVS. Dr. Burney determined that the only way to save Tyler was to insert a feeding tube in the grey's abdomen. After performing the procedure, Dr. Burney and his colleagues trained Jenny on how to feed Tyler through the tube. Tyler and Jenny stayed in Houston for several days so Tyler's condition could be monitored, before finally returning home to Westlake. The first time Jenny and Chuck fed Tyler at home, the tube appeared to be blocked, so they rushed Tyler to AEHNT in Grapevine. The tube was unblocked, and afterward the Greenbergs quickly became experts at handling Tyler's feeding tube. They learned how to produce the correct mixture and consistency for the food, including the addition of carbonation with Coke or Pepsi. They also learned how to keep the tube clean and mix/administer medicines through the tube. Once their confidence grew, feeding Tyler actually became a fun, three-time-a-day ritual for Chuck and Jenny. Tyler now had his own personal blender, and another ingredient - GasX - was eventually added to the mixture, for obvious reasons! In a short period of time, Tyler began to thrive and quickly started gaining his weight back. In no time, he was back to a very healthy weight in the mid-70s. For the first couple of months, Tyler wore sleeveless T-shirts so the feeding tube could be pinned to the shirts to keep the tube from dragging on the floor. However, it was hard to keep the shirts clean and sheltered from urine flow, and Tyler was not fond of being dressed and undressed several times a day. Chuck was determined to find a more functional wardrobe for Tyler and came home from the pet store one day with some Thundershirts - the special garments that have a calming effect on many "thunder-phobic" dogs. The snug-fitting Thundershirts were a perfect solution to the urine spray problem -- and since they were fastened with several Velcro straps, they were much easier to put on and take off. Shortly after the Greenbergs were settled into the feeding routine with Tyler, heartbreak struck again. Holly the Westie died in June 2012, at the age of 13. It was yet another blow to a family that had weathered such a storm for the preceding 2-1/2 years. What could possibly happen next? After four months of peace, the "next shoe dropped" in October 2012. Tyler's feeding tube started breaking down, so it was replaced. However, the only size available in Dallas was too small. It fell out on the first night after it was inserted. Dr. Burney and Chuck talked extensively about different options for reinserting a tube. Dr. Burney, who by this time had relocated to Dallas, decided the best option was for him to fly to Houston in order to find a tube that was the correct size. After an extensive search at the GCVS clinic, Dr. Burney finally found the right type of tube and flew back to Dallas to insert it. After the insertion of the new feeding tube, all went well for several months. Tyler could swallow water on his own, and he looked like a happy, healthy grey - who just happened to have a port in his belly! For each of his three daily feedings, Tyler received eight syringes of Iams Veterinary Formula Maximum Calorie Plus canned food -- equivalent to approximately 2-1/2 small cans -- for each meal. Occasionally, Rimadyl (for pain) or other medications were administered through the tube as needed. Two other health issues subsequently arose - a mild case of pneumonia and recurring corns on Tyler's feet. Dr. Dennis Crow, a dermatologist with the Dallas Veterinary Surgical Center, began hulling the corns on a regular basis. Tyler was no longer limping, and a new ingredient - Glucosamine - was added to one of the daily cocktails in his blender. The Greenbergs thought that Tyler was out of the woods - and he was for a while - but then came another setback in late June 2013. Jenny, Chuck and their three dogs had been staying in a hotel for several weeks because the renovation of their home in Westlake was taking longer than originally forecasted. They had postponed a trip to their Pennsylvania home because Little Jack tore his ACL and had to undergo knee surgery. This delay was actually beneficial, because it kept them in Texas - close to Tyler's veterinary team -- longer than expected. Tyler started having significant breathing problems again, and on July 1st - his 11th birthday - it was determined that his throat cancer was back. Since his windpipe was 75% blocked, Dr. Burney performed an emergency procedure to cut out a large chunk of the tumor to keep Tyler from suffocating. The next day, Dr. Burney and Dr. King began an aggressive two-week program of supercharged radiation. When the radiation treatments were completed in mid-July, the Greenbergs and their pack - with the blessings of the veterinary team - headed to Pennsylvania to await the completion of their home in Texas. Without a doubt, Tyler's feeding tube has saved his life by giving him the means to eat and take medication. Despite enduring more than 50 radiation treatments, over 80 general anesthetics, countless medications, heat stroke and cancer, Tyler's liver and kidney functions have always been completely normal. Tyler's attitude is now perpetually cheerful and eager, and his quality of life is excellent. Tyler's path from Pennsylvania to Texas has included many challenging ups and downs, and the Greenbergs feel blessed to have received so much help from such an incredible number of talented veterinary professionals who were determined to give Tyler a longer life of the highest quality with the help of modern medicine. While it may not be feasible for every dog owner to manage the expenses involved with some of these procedures, it is hoped that others will be heartened to know that some medical conditions that may have seemed hopeless in the past are now treatable. When the Greenbergs go out of town, they board Tyler at VSNT, to ensure that his special needs can be met by vets and technicians familiar with his fascinating medical history. According to the VSNT staff, Tyler has the run of the office and is beloved by all. When the Greenberg boys come home, they realize they are truly the visitors in a household ruled by their canine brothers. While Coyote and Little Jack take their own turns at being the boss, "King Tyler" also takes his turn, and he certainly enjoys a very special place in the eyes of his adoring Greenberg human pack. When Jeff gets married this fall, can there be any doubt who will be "Best Dog"? Sadly, Tyler got his wings on December 10, 2013, and is now running in green meadows at the Rainbow Bridge. He is dearly missed and will never be forgotten by all who loved and cared for him. AUTHORS' NOTE: We wish to acknowledge the significant contributions made by Jenny and Chuck Greenberg in providing the details of Tyler's story and editing the final version of this article. ABOUT THE AUTHORS: Susie McQuade, along with her husband, John McQuade, are the Co-Founders of the Greyhound Adoption League of Texas (GALT) - a greyhound adoption group with a very simple but powerful mission statement - "No Grey Turned Away™" She and Barbara Dornak Christian, a GALT volunteer and the Donation Coordinator for the group, have both adopted and/or fostered numerous greyhounds. Along with many other volunteers, they spend countless hours taking care of the hounds entrusted to GALT's care, in addition to handling several fundraising and administrative duties for this all-volunteer 501(c) (3) organization.